Home » Archive by category "Fun Foods"
Blintzes are also known as blin or blintchik (Russian names for crêpes). They are thin pancakes that can be filled with sweet or savory ingredients. 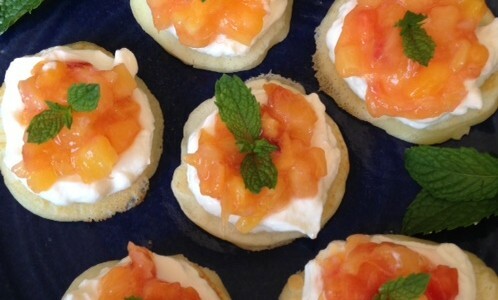 For this recipe, I made mini-blintzes, topped them with fresh Greek yogurt and added a fresh fruit compote. Enjoy these blintzes at breakfast or brunch. They’re fun to eat with Mimosa or coffee. 1. Combine all ingredients in a 1-quart saucepot. 2. Bring ingredients to a boil; boil and stir with a wooden spoon for 3 to 4 minutes, or until fruit mixture thickens. 3. If a creamier texture is desired, mash the fruit with a potato masher. 4. When fruit is tender and liquid has thickened, transfer the mixture to a glass or porcelain bowl to cool. Cover with plastic wrap and set aside. 5. Meanwhile, prepare the blintzes. 1. In a 1-quart mixing bowl, combine the egg, milk, 1 tablespoon of the oil, flour, sugar, baking powder and salt. 2. Using a whisk, blend the ingredients together until a smooth batter has formed. 3. Add the remaining tablespoon oil to a 12-inch, nonstick skillet set on high heat. 4. As soon as the oil is hot (it should not smoke), reduce heat to low. 5. Using a ladle, gently pour the batter onto the center of the skillet to form a 3-inch blintz (pancake). 6. Continue forming the blintzes, spaced 1 to 2 inches apart. You will not use all the batter for the first batch. 7. After cooking for 1 minute or until the batter starts bubbling, using a spatula, gently turn the blintzes over. 8. Cook the other side of the blintzes for another 30 seconds or a little longer, taking care not to burn the underside. 9. Transfer the blintzes to a serving platter; set aside while preparing the remaining blintzes. 1. Transfer the yogurt to a small bowl and give it a stir. 2. Top each blintz with yogurt, some fruit and garnish with mint leaves. Serve immediately. One of my favorite recipes published on this website is the Guacamole Romano. To make this appetizer even more exciting, why not spread the guacamole on toasted Flaxseed Bread with Honey and Sesame Seeds (previously published on this website). 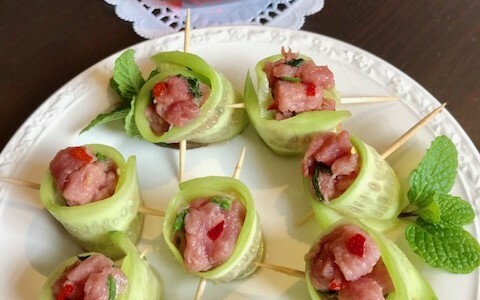 Add some chopped tomatoes and you’ve just prepared a highly nutritional appetizer. You can even enjoy this fun food for breakfast or lunch. 1. In a small bowl, combine the chopped tomatoes; toss in a little salt, to taste, and set aside. 2. 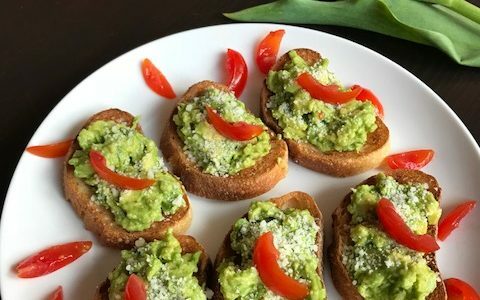 Spread a heaping tablespoon of guacamole on each toast. 3. As you prepare each toast, set it on a serving platter. 4. 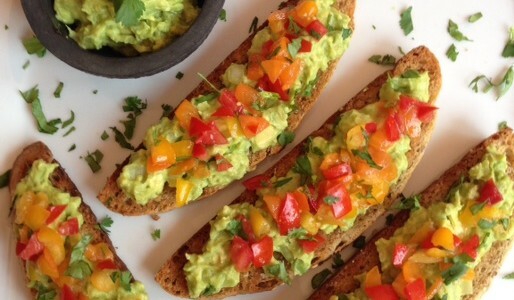 When all toasts have been spread with guacamole, divide the chopped tomatoes and top them evenly over the toasts. 5. Garnish toasts with chopped cilantro and serve immediately.